Cleveland Heights-based Choral Arts Society of Cleveland continues its 43rd season with an examination of classical expressions of folk art. In a performance that director Martin Kessler calls “one chorus, two pianos, three percussion, and four hands,” Choral Arts will treat its audience to a performance that is rollicking, sassy, heartwarming, upbeat and moving, all in one entertainment package. The concert, on Sunday, March 11, 7:30 p.m., at Disciples Christian Church in Cleveland Heights, will have added significance as Choral Arts singers honor Kessler before he retires from full-time, active directing at the end of this performance season. Kessler, a lifelong Cleveland Heights resident, has spent the past 50 years as an educator and musician, honing and channeling the artistic abilities of students, instrumentalists and singers. During his 15 years with Choral Arts, Kessler has expanded artistic awareness and entertainment opportunities through creative and innovative programming. Under his directorship, singers and audiences alike have been treated to a number of premieres, including Jerusalem-Yerushalayim by Antony Pitts, and James Whitbourn’s Annelies, a choral setting of The Diary of Anne Frank. This performance examines the enriching relationship between music and poetry. The evening’s repertoire includes Mack Wilberg’s arrangements of poems by Robert Burns, Ron Nelson’s musical interpretation of Alfred Lord Tennyson, and Liebeslieder Waltzes from Brahms, who used as his verbal inspiration the folk songs and love poems in Georg Friedrich Daumer’s Polydora. The performance culminates by showcasing Carl Orff’s dramatization of the romantic longings in medieval lyrics as arranged in his classic Carmina Burana. Supported in part by a grant from Cuyahoga Arts & Culture, the concert is free and open to the public. For more information visit choralartscleveland.org. or call 216-381-4608. Choral Arts Cleveland will perform Sacred Choral Works by Mozart & Faure as well as selections from recent performances including Bizet Carmen. Come for a relaxing and inspiring evening! A grand sense of occasion prevailed at Severance Hall when The Suburban Symphony Orchestra, under the direction of Martin Kessler performed “A Concert of Music and Healing” on Sunday, November 18. Presented by the Alzheimer’s Association of Greater Cleveland and the Neurological Institute of University Hospitals, proceeds from this benefit performance will go to Alzheimer’s treatment, therapy and research. Further adding to the sense of occasion was the Cleveland premiere of Robert Cohen’s Alzheimer’s Stories, fittingly performed on this beautiful autumn afternoon as November is designated as National Alzheimer’s Awareness Month. Opening the concert with Ravel’s Concerto for Left Hand was pianist Emanuela Friscioni, Director of the Performing Arts Academy at Cuyahoga Community College and a member of the piano faculty at The Cleveland Institute of Music. Ravel was commissioned by pianist Paul Wittgenstein to write a concerto for the left hand after having lost his right arm in World War I, and the resultant work has become one of the great masterpieces in the literature. Double basses playing softly on open strings and a dark solo by the contrabassoon imparted just the right feel of unease and ambiguity as the work bubbled and brewed with a gradual crescendo to the piano’s dramatic entrance. Friscioni was stunning in her role as soloist, playing with ease, fluidity and an unerring sense of rhythm while appropriately placing the spotlight when called for upon the work’s drama. Most impressive was her expressive delivery of melodic material while maintaining a myriad of scintillating notes within subdued, sensitively shaded colors. Kessler conducted admirably, keeping a fine rapport between soloist and orchestra. Friscioni, Kessler and The Suburban Symphony Orchestra last performed this work in October 2008 at Beachwood High School when they paid tribute to Cleveland’s beloved pianist Eunice Podis who was soloist on numerous occasions when her husband, the late Robert C. Weiskopf led the group until 1978. It was truly a pleasure to hear it again in the splendor of Severance Hall. Beethoven wrote his Fantasia in C minor for Piano, Chorus and Orchestra to serve as a “brilliant finale” to a concert which premiered his fifth andsixth symphonies in addition to the C major Mass. The sequence of variations on a theme in the Fantasia is widely believed to be an earlier version of thetheme used in the choral finale of his Ninth Symphony. Brilliant it was indeed in the hands of pianist Antonio Pompa-Baldi, First Prize winner in the 1999 Cleveland International Piano Competition and Distinguished Professor of Piano at The Cleveland Institute of Music, who was soloist on this occasion. The piano part is really an extended quasi-cadenza which is embellished first with orchestra in chamber-like dialogue, then joined by vocal soloists and chorus. Clever manipulations of the theme affirm Beethoven a master of variation as the work progresses from darkness to light in its triumphant conclusion. Pompa-Baldi showed his musical mettle, playing with a muscular and penetrating tone, projecting every detail clearly and with conviction. Phrases had beauty and direction, filigree and ornamentation were articulate. Kessler led pianist, expressive vocal soloists soprano Diane Menges, alto Bonnie Cutsforth-Huber, tenor Rick Schmid and basses Ted Christopher & Ralph Heimburger and the clear-dictioned Choral Arts Cleveland with precise cues, gesturing with care and attention to detail. After intermission came Alzheimer’s Stories by Robert Cohen, winner of the 2008 New York Composer’s Circle Award, who spoke from the stage, introducing his Cleveland premiere. Conceived in a very attractive and accessible idiom with theatrical influence, Cohen wrote his three movement work in collaboration with librettist Herschel Garfien. As a result of an anonymous donation from a member of the Susquehanna Valley Chorale to the chorale to help fund the commissioning of a musical work to honor his parents who both died from the disease, and the subsequent compilation of recorded stories from members of the Susquehanna Valley Chorale and members of the community describing their experiences with Alzheimer’s among their family and friends in 2007, a selected group of those submissions became the basis for Alzheimer’s Stories for soloists, chorus and large ensemble (more information in ClevelandClassical’s preview). In terms of getting the message out about this debilitating and devastating disease in a heartfelt and meaningful way through music, this reading of Cohen’s innovative work could be deemed a total success. Kessler’s long involvement as conductor of both The Suburban Symphony Orchestra and Choral Arts Cleveland was apparent in this well-prepared performance, which also included the Glee Clubs of Laurel and University Schools. The second movement, The Stories, is a pastiche of a number of stories selected from the choir’s blog. With a mixture of pathos, poignancy and humor, mezzo-soprano Bonnie Cutsforth-Huber portrayed a woman who thinks she’s still on a boat to Panama with her father, while baritone Ted Christopher portrayed a WWII Navy veteran who repeats the same bawdy story of the war so many times that the chorus can recite it by heart. Both soloists brought their characters to life and sang quite expressively, although a bit more projection would have benefitted Cutsforth-Huber’s reading. The history of the practice goes back to the year 590 A.D. in St. Andrew’s Monastery in Rome, founded by St. Gregory the Great in his own family villa around 570. It is now known as the Monastery of St. Gregory the Great. The account of the incident which gave rise to it is recounted by St. Gregory himself in his Dialogues. Is one of the most prolific, versatile, and universal composers of the late Renaissance, Lassus wrote over 2,000 works in all Latin, French, Italian and German vocal genres known in his time. These include 530 motets, 175 Italian madrigals and villanellas, 150 Frenc h chansons, and 90 German lieder. No strictly instrumental music by Lassus is known to survive, or ever to have existed: an interesting omission for a composer otherwise so wide-ranging and prolific, during an age when instrumental music was becoming an ever-more prominent means of expression, all over Europe. The German music publisher Adam Berg dedicated 5 volumes of his Patrocinium musicum (published from 1573–1580) to Lassus’ music. Lassus remained Catholic during this age of religious discord, although not dogmatically so, as may be seen from his more worldly secular songs as well as his imitation Masses and Magnificats based on secular compositions. Nevertheless the Catholic Counter-Reformation, which under Jesuit influence was reaching a peak in Bavaria in the late sixteenth century, had a demonstrable impact on Lassus’ late work, including the liturgical music for the Roman Rite, the burgeoning number of Magnificats, the settings of the Catholic Ulenberg Psalter (1588), and especially the great penitential cycle of spiritual madrigals, the Lagrime di San Pietro (1594). Other Mass settings by Poulenc, Vaughan Williams, Thompson will also be perfomed. “The light shines in darkness and the darkness has not overpowered it.” So begins the choral masterwork Luminosity by contemporary British composer James Whitbourn. Choral Arts Cleveland under the direction of Cleveland Heights resident Martin Kessler will perform the Cleveland premiere of Whitbourn’s celebration of light and hope. The concert, “Light and Shadow: Bodies and Voices in Motion,” is funded in part by the residents of Cuyahoga County through a public grant from Cuyahoga Arts & Culture. It will take place at Christ Episcopal Church, 3445 Warrensville Center Road, Shaker Heights at 7:30 p.m. on Sunday, May 22. Rounding out the performance will be music by Alexandre Gretchaninoff, Morten Lauridsen, Gabriel Faure, and Keith Hampton, all centered on the theme of light. An innovative and resoundingly beautiful choral piece, “Luminosity” is a multi-media, multi-faceted experience. A salient feature of the work is the dance accompaniment that Whitbourn has made an essential and integral part of his composition. Dancers for the Choral Arts performance will be members of Cleveland’s Verb Ballets with choreography by company member Terence Greene. Choral voices and dance movement—“bodies and voices in motion”—will be accompanied by organ; viola; tam-tam, a large gong; and tanpura, a long-necked, four-stringed instrument found in various types of Eastern Indian music. James Whitbourn refers to his composition as one “conceived with a visual counterpoint to the music in mind, coming in the form of art, dance and light as well as in the use of space. The focus in all the elements is on transcendent beauty and eternal love. It is likely to be symbolic, luminous and shapely in concept.” To create his celebration of light, Whitbourn has assembled the choral sections from texts by St. John, Buddhist nun Ryonen, Isaac of Nineveh, Julian of Norwich, Theresa of Avila, and Augustine of Hippo. These texts, voices, instrumentation, and dance movements blend into a natural and harmonious whole that is both pleasing and accessible to those who avail themselves of the unique experience. Having been an artistic force in Cleveland Heights for 40 years, Choral Arts Cleveland with its performance of Luminosity continues its mission of bringing new artistry to its audiences. Along with staples from the classical repertoire, Choral Arts regularly introduces its audience to accessible contemporary artistic gems. Recently these have included premieres of William Godfree’s Requiem, Antony Pitts’ Jerusalem-Yerushalayim, Robert Cohen’s Alzheimer’s Stories, and, in May 2015, Whitbourn’s Annelies, an oratorio based on excerpts from the diary of Anne Frank. Established in 1975 as a chorus composed of Cleveland Heights High School alumni and parents, Choral Arts membership is comprised predominantly of those who live in and support the Heights community. Director Martin Kessler is a graduate of Cleveland Heights High School where he was student conductor of the Heights Choir. Retired from University School’s Hunting Valley Campus where he served for 32 years as Director of Music, Mr. Kessler remains musically active. In addition to directing Choral Arts, he is Director of the Suburban Symphony Orchestra and an adjunct professor in CSU’s Department of Music. He is also a composer and essayist. He lives in Cleveland Heights with his wife Joyce. Schöpfung) and The Seasons (Die Jahreszeiten), near the end of his musical career in Vienna. He had heard performances of Handel’s Messiah in London and was so moved by the piece that he decided to write something similar. With financial support for his project from his librettist and mentor Gottfried van Swieten, his first oratorio, The Creation, premiered in Vienna in 1799 to universal praise. It is said that Beethoven was in attendance and that after hearing the piece, the young composer was so overcome by its power that he knelt in homage to Haydn. The Seasons was first performed on April 24, 1801, at the palace of Prince Schwarzenberg. On May 29, Haydn conducted the first public performance, which was an immediate success. Like The Creation, The Seasons was intended as a bilingual work. Since Haydn was very popular in England (particularly following his visits there in 1791–1792 and 1794–1795), he wished the work to be performable in English as well as German. Van Swieten therefore made a translation of his libretto back into English, fitting it to the rhythm of the music. Olleson notes that it is “fairly rare” that the translated version actually matches the Thomson original. Van Swieten’s command of English was not perfect, and the English text he created has not always proven satisfying to listeners; for example, one critic writes, “Clinging to [the] retranslation, however, is the heavy-handed imagery of Haydn’s sincere, if officious, patron. Gone is the bloom of Thomson’s original.” Olleson calls the English text “often grotesque”, and suggests that English-speaking choruses should perform the work in German: “The Seasons is better served by the decent obscurity of a foreign language than by the English of the first version. Choral Arts Cleveland will perform The Seasons in English over the course of 3 concerts. Behold where surly Winter flies, and far to the north passes off. He calls his ruffian blasts, his blasts obey and quit the hill, the forest and the vale. Behold the craggy mountain peaks, where softer gales dissolve the snows. Forth fly the tepid airs, and unconfined, unbinding earth, the moving softness strays. At last the bounteous sun from Aries into Taurus rolls. Now sickly damps and fogs give way to light and temp’rate airs that lift the white and fleecy clouds and spread them through the sky. and they begin their toil again, cheered by a simple song. and prays the ripening sun will crown the year with golden corn. he prays that heav’n, he prays that heav’n will favour him. pour down thy sweetness o’er the freshened world below. descend, descend and temper all; and let the sun revive the world. This annual plenteousness demands the praise and thanks of all Mankind. is deep enriched with life from Nature’s ample store. Spring, fair-handed Spring unbosoms every matchless grace. Come, companions, let us wander in the fragrant air. Come, good fellows, let us wander through the greenwood fair. see the verdant bowers. See the woodland, see the waters, see the azure sky! All is living, all is stirring, while the landscape laughs around! See the lambs that frisk and gambol; see the fish that swim and tumble. See the bees that swarm together; see the birds that soar and flutter. What enchantment, what enjoyment, swells within our hearts! Sweetest longings, softest passions, stir within our breasts! Every feeling, every rapture, is the mighty, the mighty Creator’s breath. Let us honour, let us worship, let us magnify his glorious name. Let our voices sing his praises and resound on high. With thine abundant goodness hast thou revived the world. For thou hast, with thy mighty hand, poured blessings on the land. Endless praise to thee we sing, wonderful, bountiful, merciful God. At first, faint-gleaming in the east, the meek-eyed morn appears. With tardy step brown Night retires, and Day pours in apace. and all their mournful cries oppress the timid heart no more. the soon-clad shepherd-boy, who sets forth on his morning task. to graze along the verdant hills, slowly winding o’er the lea. to see the powerful king of day dart his glorious beams around. while burnished mountains high gleam from afar. Behold, the sun arises; he gleams, then mounts his throne in bright array! He shines resplendent on high in boundless majesty! Hail, thou glorious sun! Thou source of light and life, all hail! Thou soul of all surrounding worlds, in whom thy Maker shines, we raise our song to thee. How shall I then attempt to sing the source of light and life below? Who can recount the myriad blessings that in effusion from thee flow? But firstly let us praise the Lord who gave thee power and might. The voice of all Creation rejoices in thy power. the russet haycocks rise behind. darts down forceful rays on all things below. languish man and beast outstretch’d upon the ground. O welcome now, ye shady groves; ye lofty pines, ye aged oaks! with murmuring leaves and boughs. and how delightful is the hum as Nature swarms with life. and from the rural shade is heard the shepherd’s tuneful pipe. coolly glides through every nerve, refreshing weary hearts. and gladly beats the heart with life and strength restored. the fighting winds ferment and clash while all is calm below. Hark! From the mountain there comes a roar that may portend a storm. Behold the baleful clouds that gather, threatening, overhead, and darken all the world below. A boding silence reigns throughout the dun expanse. No leaf within the forest shakes; a deathly hush is in the air. Hark! the tempest nearer comes. Heaven help us! Eruptive through the clouds the thunder rolls on high. the crashes of awful thunder draw nigh, and down comes a deluge of rain. Still the tempest growls; and still the heavens are rent. Run for shelter! Peal on peal, with fearful crash, convulsing heaven, the thunder rolls! The firm and deep foundations of earth itself are moved. The shattered clouds now melt away and from the face of heaven depart. And Nature shines out freshly, through all the lightened air. The setting sun with yellow ray invests the fields with glittering robes of joy. Home from his evening task returns the shepherd, his folded flock secure. The frog is croaking in the pool. The curfew tolls the knell – the knell of parting day. In heaven shines the evening star, inviting all to sweet repose. that simple hearts, and healthy lives, and honest labours surely have earned. Over the past four years, the Choral Arts Society of Cleveland received more than $16,000 in support from Cuyahoga Arts & Culture, which has helped us bring several musical premieres to our Cleveland audiences: Jerusalem-Yerushalayim by Antony Pitts, Requiem by William Godfree, and Annelies by James Whitbourn. Having both artistic and educational components, these projects are some of the many throughout Cuyahoga County that strengthen our community and enrich the quality of life in our neighborhoods for people of all ages. Because CAC has assisted in these projects, we’d like to take this opportunity to tell you more about this extremely important funding partner. 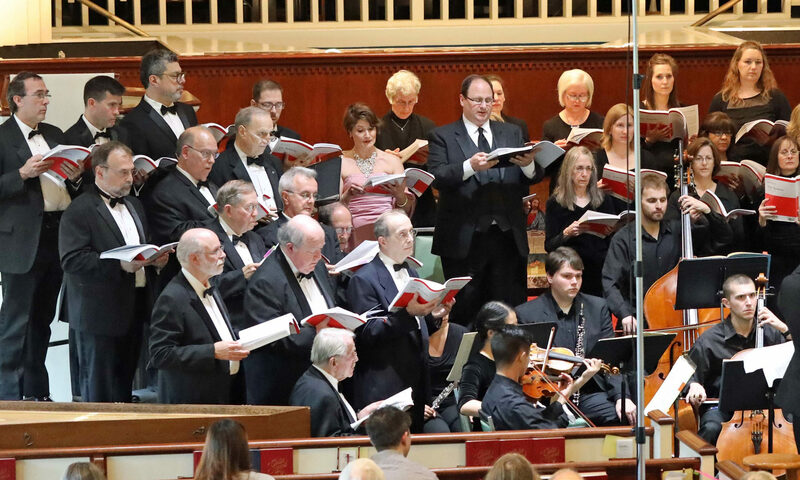 The financial support received from the residents of Cuyahoga County through Cuyahoga Arts & Culture has helped Choral Arts fulfill its mission of entertaining and educating it membership and its audiences. First, we have been able to introduce singers and audiences to contemporary composers like Antony Pitts, William Godfree, James Whitbourn, and Bob Chilcott, composers whose pieces have enticed singers and audiences out of the ordinary choral repertoire into music that has been accessible, exciting, and moving. Second, CAC grants have enabled us to engage first-class soloists for our projects. Third, we have been able to effect historical awareness through pieces like Jerusalem-Yerushalayim and, most recently, Annelies (an oratorio based on excerpts from the Diary of Anne Frank). Also, projects such as Annelies have addressed serious issues facing humanity. These results mean that financial support from CAC has helped Choral Arts deepen its mission of benefiting the community of which we are a part. Cuyahoga Arts & Culture is the public funder of arts and culture organizations, programs and events in Cuyahoga County. Cuyahoga Arts & Culture’s sole funding source is a dedicated cigarette tax levied within Cuyahoga County. Established by voters in 2007, CAC has awarded over 1,200 grants since then, distributing over $125 million in tax dollars to more than 300 organizations based in the County. Renewal of this funding source will be on the ballot this Fall on November 3 for voters to consider. Please take a few minutes to learn more about this important source of public funding and Cuyahoga Arts & Culture by visiting their website: cacgrants.org. Choral Arts Cleveland will present George Frideric Handel’s “Judas Maccabaeus” with soloists Tim Culver (tenor), John Watson (bass), Diane Menges (soprano), and Sandra Ross (alto) on Sunday, November 22, 2015 at 7:30 in our new location, Disciples Christian Church, located at 3663 Mayfield Road in Cleveland Heights. This seminal work, rich with religious and musical meaning, opens our 2015-16 season. On November 22, Choral Arts Cleveland launched its 2015-2016 season with Handel’s rousing oratorio, Judah Maccabaeus, telling the tale of the Maccabean Revolt (167-160 BC). The Jewish festival of Hanukkah celebrates the rededication of the temple after the successful end to the conflict. The 60-member chorus was joined by a wonderful chamber orchestra and splendid soloists in this first concert in our new venue. Choral Arts has long made its home in Cleveland Heights rehearsing and performing at Grace Lutheran Church, but when the church was recently sold we had to find a new venue. We were lucky. The truck was loaded and the driver given directions to one church when that church informed us that they would not be able to accommodate our group after all. Fortunately, Disciples Church on Mayfield Road in Cleveland Heights opened its doors to us and we were able to move in and set up just in time for our first rehearsal. We are now comfortably ensconced in a large practice room and are hard at work preparing for our second program in the exciting 2015-2016 concert season. On March 6, 2016, we will present an evening of a cappella music including Gregorian Chant; music by the Franco-Flemish, Renaissance master of choral music, Orlando di Lasso; and work by 20th century French composer, Francis Poulenc. In addition to settling into our new home and diligently preparing for our concert series, Choral Arts is actively working toward expanding our outreach in the community, touching more listeners and attracting more singers. Using funds from a Cuyahoga Arts & Culture grant, we have hired an outside consultant, Janus Small, to help us reformulate our mission, vision, values, and organizational structure to prepare for the next 40 years of singing. Ms. Small has over 30 years of experience in non-profit management and planning, and is on faculty at John Carroll University. We will work closely with Ms. Small to recruit and retain both singing members and board members and focus our resources on bringing our message of music, beauty, and joy to the Cleveland area. Choral Arts Cleveland rehearses on Sunday evenings from 7:00 p.m. to 9:15 p.m.